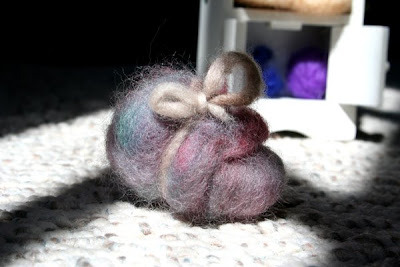 Elizabeth's been busy since her first felted wedge of cheese yesterday. She has a whole cupboard full of felted food now. From top to bottom, she made a buttered baked potato, an ear of corn, an orange and the wedge of cheese, a slice of bread, and at the very bottom, some blueberries and a plum. For dessert, a bundle of cotton candy, of course! 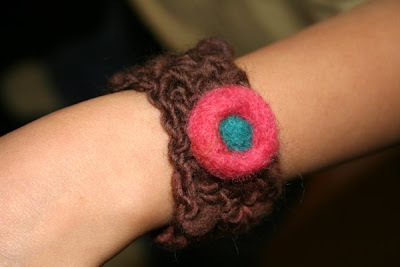 I took a break from work for a few minutes this afternoon to make Elizabeth this wool bracelet. 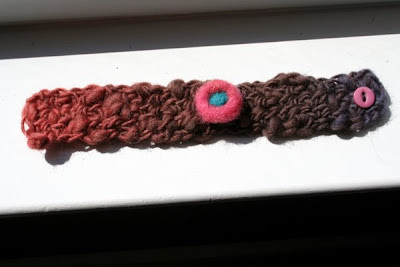 I've been wanting to try this idea from 5 Orange Potatoes, but I don't have any wool felt yet, so I decided to try making a crocheted bracelet with a needle felted embellishment in the meantime. Elizabeth was quite happy with this version of the bracelet. 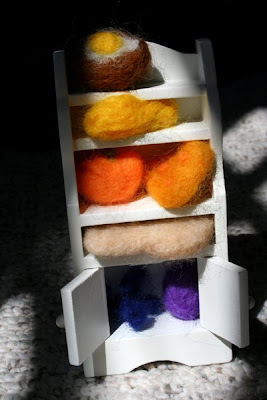 Love all of the beautiful felty things! I am so in love with the way you made this idea yours!!!!! This is FANTASTIC Joy! Elizabeth's little foods are the cutest. I love that she's getting so into her felting-- smart girl! That bracelet is sweet, too. love the felted food - especially the buttered baked potato!! 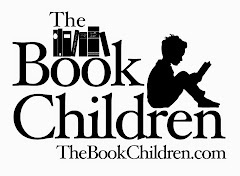 It's so great when kids take a new idea and just RUN with it! So great to see-and cool food, too! I love that bracelet! Looks cozy!